The Lil Divas love to color so when I was contacted by Colortime to review their products I didn't hesitate. Colortime Crafts and Markers specializes in easy and fun fabric craft projects. 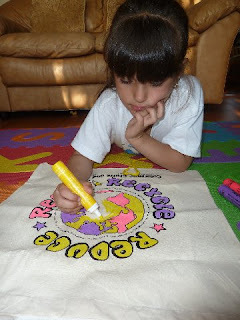 They offer a variety of products such as t-shirts, tote bags, pillow cases, bandanas, backpacks, bibs and headwaraps which can be colored and personalized with their fabric markers. These make unique party activities which can double as party favors because the guests get to keep them, great scout crafts, camp crafts, classroom crafts and more. 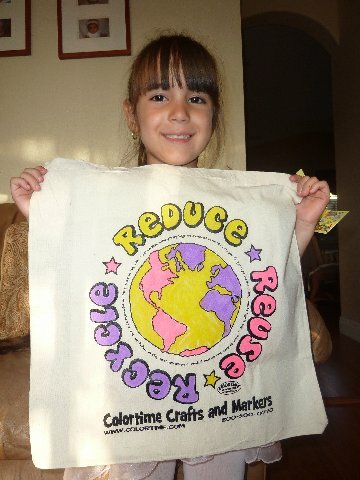 We received the Market Bag/Tote and a few fabric markers to sample. The bag was actually larger than I expected it to be and would be perfect for quick trips to the store/market or even the library. Colortime Crafts and Markers markets itself as an "easy" kids craft and we certainly found it to be true. Everything was easy to use, the directions that came with the products were simple and easy to understand and follow. 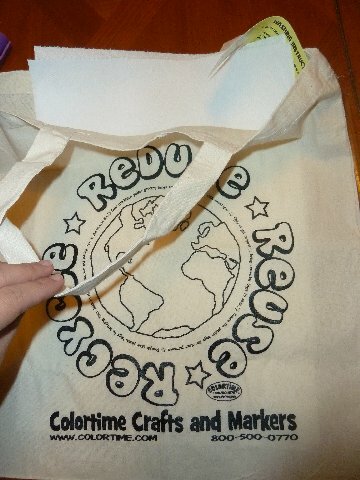 For our purposes, we were told to put a napkin inside the tote bag while coloring. 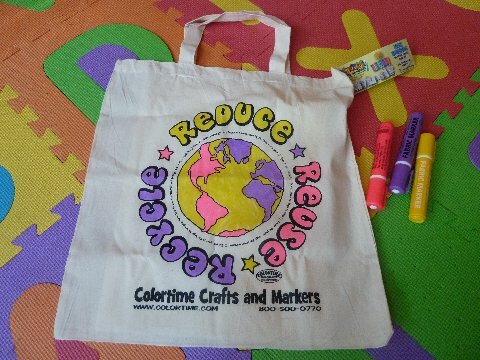 I used 2 to be safe but one would have been enough as stated - nothing ran through yet the colors on the bag colored in nice and bold and bright. The Lil Divas took turns painting the bag- I found this was the best way because they seemed to want to use the same colors at the same time (of course). Both of them were able to color without any problems and they each enjoyed decorating the bag. Our finished bag was one both the Lil Divas were proud of and definitely something we we will be making use of in the future. 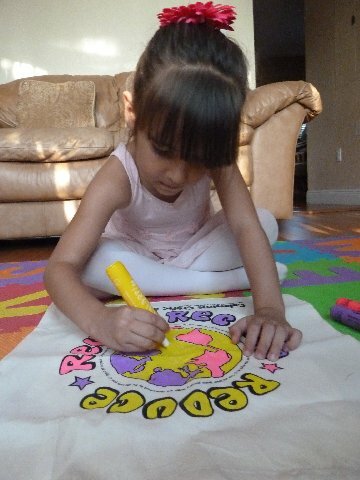 The Colortime fabric markers are permanent on fabric but they are non-toxic and wash off hands with soap and water. We had no problem with any staining on Lil Diva hands. The lil bits they colored on themselves did wash off easily. All of the products including our Market Bag are machine washable. We did not have occassion to wash ours yet but the directions do state it is machine washable and will hold it's color even after many washings. Overall, I was impressed with the ease of the the craft. The Lil Divas enjoyed it and it's nice to have something that they had a hand in making. This is definitely something I will keep in mind for future birthday parties. 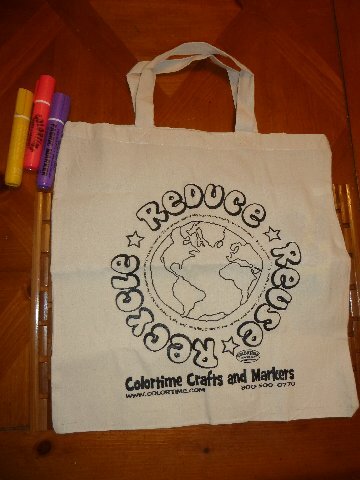 Buy It: ﻿You can purchase the crafts and fabric markers directy from Colortime Crafts and Markers website. 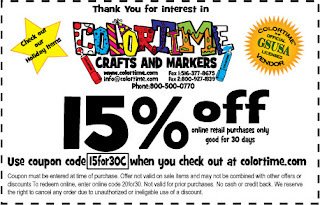 As a special treat to Mom to 2 Posh Lil Divas followers Colortime Crafts and Markers is offering a special 15% off Coupon Code on online orders (valid for Mom to 2 Posh Lil Diva followers until June 28th, 2011!). Simply use Code 15for30C at checkout to receive the discount. You can also "Like" Colortime Crafts on Facebook - they are currently doing weekly fan appreciation giveaways for their wonderful products so it pays to be a "fan"! Oh how cute love it!!!!! !